Just outside the Marketing and Communications office on Coliseum Campus, there was a commotion: crowds milling about, clutching plates, and a man at a griddle. Was that a spatula through his head? 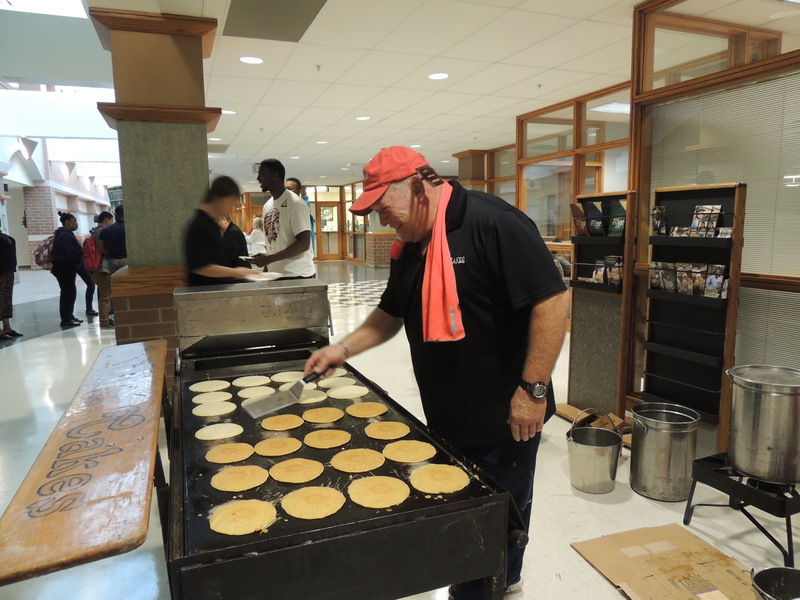 As part of the College’s “welcome back!” for students this week, Chris Cakes set up its traveling breakfast bar, serving up breakfast sausage and freshly made pancakes. 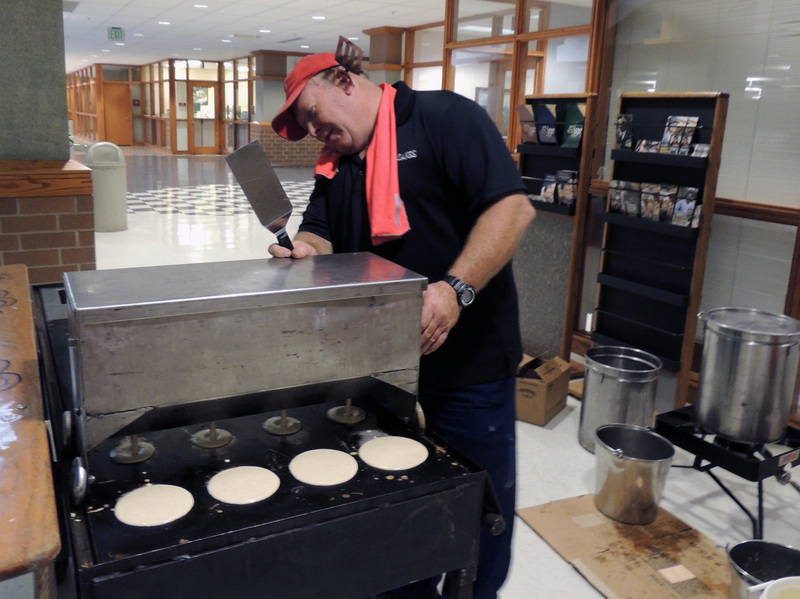 Trevor Muir of Chris Cakes works on his 4-foot grill to serve breakfast to students at Coliseum Campus on Thursday. Chris Cakes is a franchise company with spots in 22 states. The company has fed four presidents (that’d be Obama, Bush senior, Bush junior, and Regan) and now, hundreds of Ivy Tech Northeast students and staff. Trevor Muir, of Chris Cakes, uses a machine with four spouts to dispense batter onto the grill. 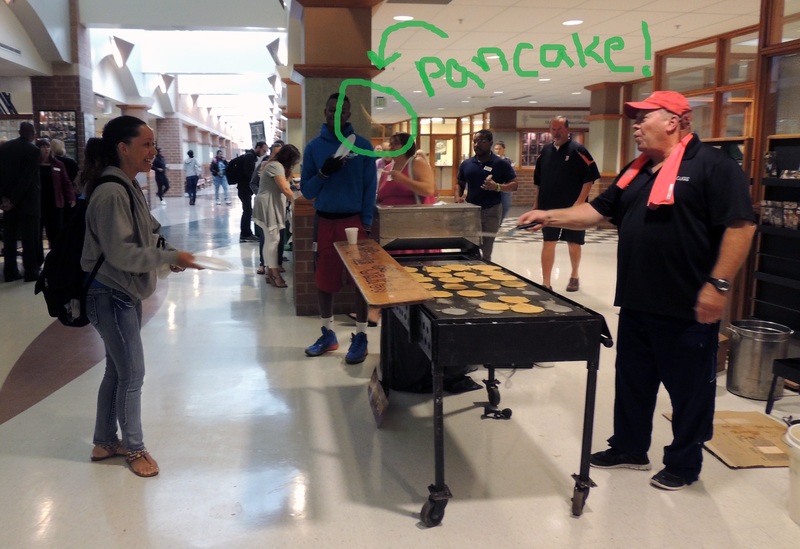 “I can feed 350 people an hour,” says Trevor Muir as he manned the 4-foot, 28-pancake grill. The company also has 8-foot and a 16-foot grills. After doling out the flapjacks–sometimes by flinging the little cakes 10 feet across the hall to a student with an empty plate–Muir would make more with a metal compartment that rolled over the grill. The container, which holds 50 pounds of batter, had four spouts across its length, and Muir would roll it down the grill, stopping at intervals to dispense batter onto the grill. Chris Cakes has been featured on Food Network at least 10 times, Muir says, and the most pancakes a Chris Cakes customer has chomped down is 77. Trevor Muir flips a flapjack to a student on Thursday on the Coliseum Campus. Ivy Tech Northeast student Nick Lowden gets in position to catch a pancake. 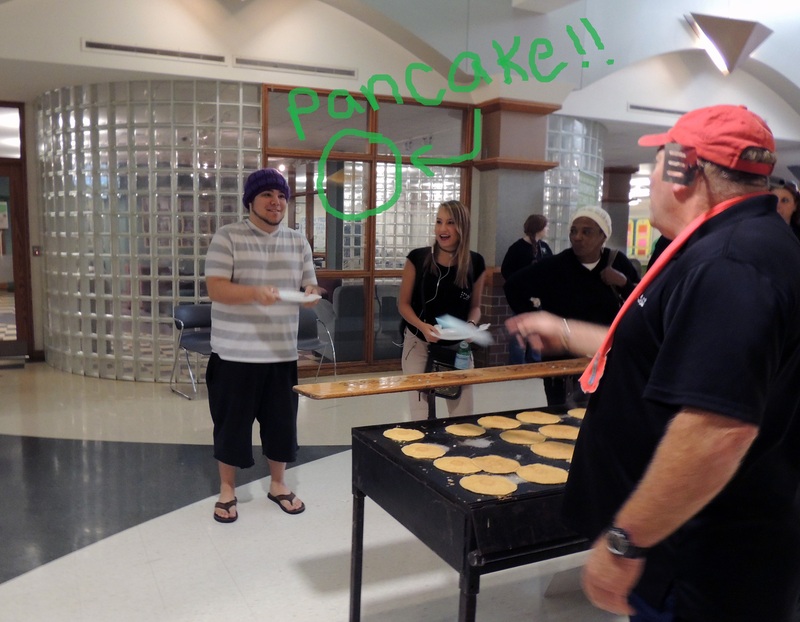 This entry was posted in Green Light and tagged Chris Cakes, first week of classes, first week of school, fort wayne, ivy tech northeast, pancakes. Bookmark the permalink.